With some of the most spacious hotel rooms in Midtown Manhattan and over 86 sumptuous suites, The Palace offers guests the ultimate in NYC luxury. All beautifully appointed with comfortably elegant furnishings and thoughtful amenities, many of the 899 guestrooms and suites offer stunning views of St. Patrick’s Cathedral and the surrounding cityscape. Palace guests have a choice of Superior, Club and Towers accommodations, or the four crowning penthouse Triplex Suites. Each Triplex Suite features an outdoor rooftop terrace that overlooks Manhattan and offer panoramic views of the city’s spectacular skyline. All guestrooms and suites are impeccably furnished and feature marble bathrooms, separate seating areas, full-sized desks and either a king bed or two double beds. For your convenience, all guestrooms at our Midtown Manhattan luxury hotel are equipped with high-speed wireless and broadband Internet access, three telephone lines and an in-room safe. Heralded as one of the most romantic hotels for Manhattan weddings and receptions, The New York Palace is a magical location for celebrating one of the most important days of your life. Every detail of your Manhattan wedding will be considered and every expectation exceeded with the renowned service and iconic elegance for which the hotel has long been known. Offering 22,000 square feet of sophisticated space for wedding receptions and special events from the scenic courtyard to the stunning ballroom, this landmark hotel in the heart of Manhattan is the perfect place for the perfect beginning. 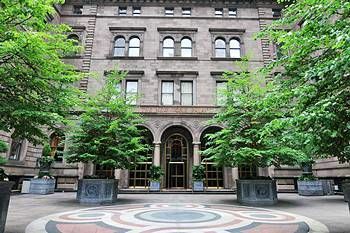 Learn more about our New York City wedding reception locations and event venues.